Today’s software companies face decreasing sales and/or shrinking margins global and national economic pressures, increased competition and the tendency for sales teams to sell on price rather than value. These factors have contributed to some software/services being commoditized resulting in an increase in discounting and concessions. Additionally, software companies that have adopted the Software-as- a-Service (SaaS) delivery and pricing model require their sales teams to learn and execute different sales practices/processes. SaaS requires a sales teams to adopt a longer term perspective that emphasizes client retention. This end in mind requires an empathetic, highly consultive, service-centered approach to the selling process for it to optimize a company’s recurring revenue stream. Selling SaaS is unique. It’s not like selling real estate, insurance or manufactured goods. Therefore it’s wise to select a training partner with proven experience in software, SaaS and/or technology sales. A successful sales improvement initiative requires a program that’s highly relevant and 100% applicable to selling your specific software/services to your specific target markets. Anything less and you risk confusion, contradiction and/or chaos as your sales team tries to integrate the new training with what they already know and use. 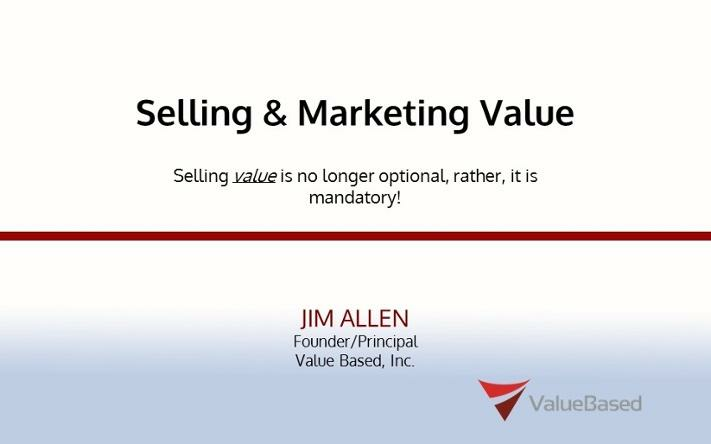 Value Based Selling (VBS) is the only sales approach specifically developed by software sales professionals for software sales professionals. The course emphasizes the building of prospect/client trust and confidence, service-centeredness and empathetic listening, along with the use of personalized value(s)-based messaging to describe and present your solution. When a software or technology sales team achieves competency in the 33 VBS best practices/processes, they’re equipped to attract new clients, sell value over price, and increase recurring revenue for your company by improving client retention. This approach not only attracts and retains prospects/customers it appeals to sales teams that welcome a sales methodology that equips them to represent your software/ services in an ethical, natural and value-based fashion. RFgen, a privately held mobile data collection software company founded in 1983, began it's Value Based journey in 2008. Despite looking at multiple alternatives for sales staff training, RFgen chose Value Based because of their unique approach to software sales. RFgen President Robert Brice commented, "We liked the idea of the Value Based selling because the key is not just being able to engage in a consultive and a solutions sale, but it has helped us to clearly understand and articulate our value proposition to the customer in a manner that differentiates us from the competition." Since adopting the Value Based methodology, RFgen has seen continued growth over the last 5 years, and they continue putting new Account Executives and Consultants through the Value Based course. Brice comments, "We've met or exceded all of our sales targets and we look like we're going to do it again this year." Brice advises, "If you are running or responsible for a sales organization you have sales people who are constantly discounting in order to win the business, you should probably look at this course." Since the release of Value Based Selling, over 5,500 software sales professionals have participated in VBS seminars and workshops throughout the U.S., Canada and Europe. Large software companies like IBM, Intuit and Sage, and software subsidiaries of 3M and GE, as well hundreds of small and midsize software companies have benefited from the VBS course.